NetApp, a top global storage and data management company ranked in the Fortune 500, provides a full range of enterprise-class solutions that customers use to modernize infrastructures, build next generation data centers and harness the power of hybrid clouds. To enable a digital innovation journey for their customers, NetApp relies heavily on its partner network. Resellers create and deliver innovative systems and software solutions to key enterprise customers. Alliance partners complement NetApp technologies to modernize existing data center environments. NetApp’s new and emerging cloud partner ecosystem provides technology and consulting services to connect enterprises to the scale, reach, and efficiencies of the public cloud. To succeed, NetApp needed an innovative approach to engage and empower their field team and valuable partner ecosystem. In 2008, a time of explosive global growth for NetApp, global sales and marketing teams were faced with thousands of internal staff and partners to support and engage. Sales and partner enablement teams were producing a wealth of innovative programs, tech systems, and content. As this pool of resources grew, it became increasingly difficult to connect users with the resources that they needed when they needed the particular resource. NetApp needed a way to seamlessly bring together different sales, marketing and partner-facing systems and resources into a digital engagement experience that could deliver the right programs and tools at the right time from a single unified interface. In addition to resource distribution challenges, NetApp had to find a way to personalize content to the unique needs of each end user. NetApp selected Webinfinity in 2008 to enable its first partner relationship management system with the Silver Partner Center. The partner program initially provided key recruitment, onboarding and sales enablement functionality. Over the years, NetApp expanded its use of Webinfinity to integrate additional field sales enablement applications for both direct and partner sales teams that previously had been disjointed and locked behind separate logins. NetApp’s Webinfinity-powered platform is designed for high volume and global scale. 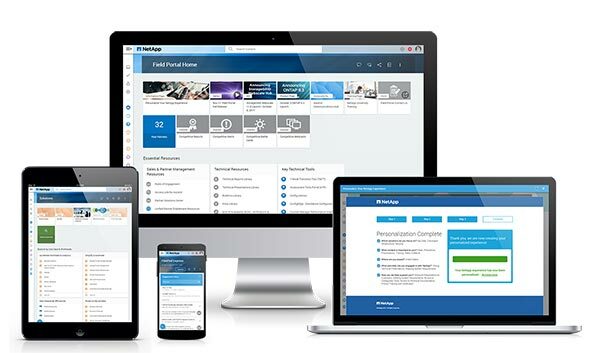 The NetApp Field Portal currently supports 32,000+ unique users across NetApp’s internal employee and external partner ecosystems. The Field Portal contains 22,000+ assets including documents, videos, external system links and images. Additionally, the Webinfinity powered partner directories, like the Solution Connection and Partner Finder, support 2,500+ and 45,000+ unique users respectively. The Field Portal is the third most used application within NetApp and its usage continues to grow significantly each year. Webinfinity’s platform delivers reliable performance and uptime globally. NetApp has offices, employees and partners in almost every country on the planet. The system’s multi-language capability easily supports 14 languages with thousands of translated documents automatically served to users in their native language. This means Webinfinity must be highly performant and operational at all times. NetApp and Webinfinity operate in a tight partnership to ensure NetApp employees and partner users have dependable access to curated resources at a moment’s notice in any location and on any device. The Webinfinity platform takes a best of breed approach to partner management technology, allowing vendors to integrate multiple front and back office applications into an automated and highly personalized digital user experience for employees, partners and clients. Content and data are woven together dynamically and intelligently based on user roles and requirements. Webinfinity’s automation and personalization capabilities allow the appropriate resources to be delivered to the user exactly when these resources are required. Webinfinity surrounds this digital user experience layer with an industry leading analytics suite allowing channel leaders to measure and evaluate the effectiveness of their partner programs. Webinfinity’s automated, personalized, and scalable digital user experience platform provides a significant competitive advantage while affording NetApp the confidence to know the company has the proper tools in place to ensure future scale and success. Targeted experiences are planned for additional partner groups in the near future, each now easily implementable with a standard methodology, supported by the highly flexible configurability of the Webinfinity platform.